Bloggers Unite! This month, bloggers around the internet, have been committing to write on their personal blog about a certain subject for each day of October. Read more about this project at the Nesting Place and see what other bloggers have chosen to write about. My friend Alison at Beauty In All Things challenged me to find my own 31 day topic. Some of my ideas included 31 stories of my childhood (I’ll save that for my memoirs), 31 days of Pinterest fall crafts (as I’ve said before, I’m not that crafty), and 31 days of homemade Christmas gifts (but for goodness sake, I just started working again, there’s no way I can do that one). 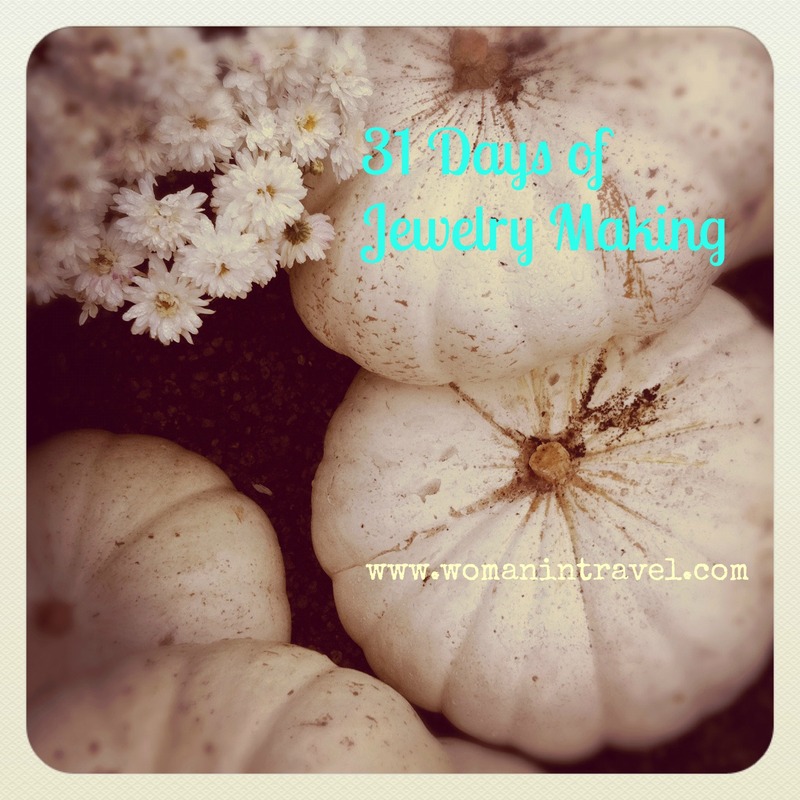 So I chose 31 days of Jewelry Making as I’ve been playing around with making cuffs, and this discipline might lead me to explore other creative pieces. helpful site rencontre 2cv la rochelle 2015 agencias matrimoniales en argentina hommes et sites de rencontres straight from the source rencontre femme zarzis site rencontre amicale 34 http://heartpearls.com/?mistyu=mujeres-solteras-de-azogues&852=09 partnersuche aschaffenburg kostenlos http://tjez.gob.mx/perdakosis/7794 Note: As the days have progressed in this 31 day writing challenge, I’ve realized my real passion is in repurposing the jewelry, not necessarily making it. So the blog challenge has taken a bit of a change after Day #1, but change can be good, and hopefully it will inspire you to look at things differently that may (with a little imagination) turn into an accessory you really love. Thanks to my editor Katie at Trekaroo and her fabulous kid’s parties she throws for her daughters, I learned how to make these cool feather earrings. And they are SO easy! My daughter is making these for her 5th grade “Market” where the kids make their own goods and “sell” them to fellow classmates for points. I think they are going to be a huge hit with the tweeners. To make, get yourself to Michaels (with your coupon, of course), and purchase a bag of feathers (there was turquoise, green, and orange group of feathers), fishhook earrings, closures, and jump rings. I also used needle-nosed pliers, but those were in my tool box already. To assemble, I squeezed the closures shut around the top of the feather with the pliers. I opened the jump ring, hooked it to the ring on top of the closure, and then hooked it to the ring at the bottom of the fishhook. 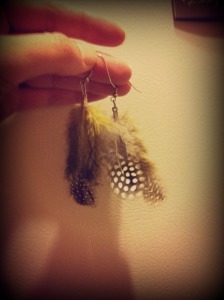 I closed the ring, and the feather earring was done. That easy. There’s two ways to get a different look. In the earrings shown in the picture, I put two feathers in the same closure so they would hang down together. Another way to get more of a “moving” look is to add a closure to two different feathers and when assembled, the feathers swing. I haven’t worn these to work since they may be a little too Bohemian for my new conservative job, but they will definitely be my go-to’s for my next Mama’s Night Out. Day #21: What About Pins? Day# 22: What To Do?